Orlando Pride: Harris; Edmonds (Hill, min. 54), Krieger, Zadorsky, Pickett (Nairn, min. 71); Kennedy, Weatherholt, Camila (Mônica, min. 64); Marta, Morgan, Ubogagu. Chicago Red Stars: Naeher; Gilliland, Naughton, Ertz, Short; Mautz (Vasconcelos, min. 74), Brian, Colaprico, DiBernardo (White, min. 90+2); Nagasato (Stanton, min. 86), Kerr. SCORE: 0-1, min. 43, Kerr. 0-2, min. 45+1, DiBernardo. 0-3, min. 59, Kerr. 1-3, min. 65, Morgan. REFEREE: Guido Gonzales (USA). Yellow Card: Camila (min. 42), Zadorsky (min. 79), Mônica (min. 82). That's it for me tonight and thank you to everyone who followed the match on VAVEL USA. Until next time! Full time: Kerr and the Chicago Red Stars drop three goals on Orlando on their way to what they hope will be a playoff berth. Up until Morgan's goal Orlando were listless and they continued to be poor as the second half wound down. Chicago now controls the path to the final playoff spot while Orlando will look back at tonight with regret. 90+4' Marta commits a foul out of frustration as Orlando's playoff hopes are now over. 90+2' SUBSTITUTION: Rosie White is the final change for Chicago as she replaces DiBernardo. 89' CHANCE! Naeher almost gifts Orlando a second goal! Both Gilliland and Julie Ertz leave the ball for Naeher to pick up but she makes a mess of it and Ertz has to just boot the ball away with the goal gaping. 86' SUBSTITUTION: Nagasato's night is done as she's replaced by Nikki Stanton. 85' Marta finds some space at the top of the box but her shot is straight at Naeher. 82' YELLOW CARD: Mônica gets booked for bringing down Nagasato in midfield. 81' CHANCE! DiBernardo finds Kerr with the set piece right in the six yard area but she heads it over! 80' Chicago win another corner as Harris beats away Vasconcelos' cross at the near post. 79' YELLOW CARD: Zadorsky gets a card from tripping u Kerr. The Red Stars forward would've had the entirety of the Orlando half to herself had Zadorsky not fouled her. 77' Kennedy goes from distance but her shot is blocked. The ball ends up with Ubogagu out wide but her cross is wayward. 75' The substitute has gotten some touches straight away and has now won a corner for her team. The corner doesn't amount to anything though. 74' SUBSTITUTION: Michele Vasconcelos comes in for Mautz as Chicago's first change. 73' Morgan collects Marta's long ball well but she's offside. 71' SUBSTITUTION: Christine Nairn is Orlando's final change as she comes in for Pickett. 69' Marta almost finds Morgan again but DiBernardo is there to clear the danger. 67' Orlando have woken up slightly here but Hill can't quite get her cross right to capitalize on the counter that Orlando got. Marta breaks and gets to the byline before swinging in a cross that Morgan gets to first and diverts past Naeher. 65' GOAL! Morgan gives Orlando some hope! 64' SUBSTITUTION: Mônica comes in for Camila as Orlando's second change. 63' Orlando try to mount an attack and Kennedy goes for an overhead kick but, it isn't a great attempt. 62' Morgan sends Ubogagu down the wing and she spots Hill at the far post but her cross is just too high for her teammate. Kennedy gets stripped by Kerr right on the edge of her won penalty area and Kerr gives Harris no chance this time. 59' GOAL! Kerr is on the scoresheet again! 58' Kerr almost wriggles free again but is brought down by Camila at the halfway line. The referee gives a final warning to Camila who's on a yellow card. 57' Gilliland is there again to cut out Hill's cross and Chicago go on the attack. Nagasato and Kerr play a one-two and instead of finding Nagasato again, Kerr goes for a special goal but it's well wide. 56' Ubogagu brings the ball forward after some great play from Marta but Gilliland stands tall again and stops any attack. 54' SUBSTITUTION: Rachel Hill replaces Kristen Edmonds as Orlando goes for it here. 53' CHANCE! Krieger produces a goal line save! Kerr finds Mautz completely unmarked and she tries to find Nagasato but Krieger is there to clear off her own line! 52' Morgan Brian creeps into the box but Krieger is there to clear out the ball before Brian can get a shot off. 50' Orlando wins a free kick and Pickett finds Kennedy at the far end of the box but her header doesn't trouble Naeher. 48' Play has stopped to Sam Kerr can receive some treatment. Kerr heads to the bench to be looked at more closely and play resumes. 47' CHANCE! Chicago are through on goal again and Harris is there to shut down Nagasato's effort! 46' Chicago get us started in this second half. We're minutes away from a big second half from Orlando. They need to do much better or they will be out of the running for the playoffs when the final whistle blows. Half time: The whistle blows to end this half with Chicago in control. The Red Stars midfield have had plenty of space and time to create for their strikers and Kerr has been the biggest beneficiary of that. Orlando are not playing well tonight despite the pressure they are under and they will need a big second half to stay in the playoff hunt. Kerr turns provider as she sneaks in behind the Orlando backline and picks out DiBernardo. The Red Stars No. 10 makes no mistake form inside the box and puts Chicago up by two. 45+1' GOAL! DiBernardo gets the goal her play has deserved! 45' Orlando try to respond quickly as Marta creates a little gap for herself but her shot is deflected and makes it easy for Naeher to gather. Chicago combines well and Nagasato plays a lovely touch to put Kerr into some space. The striker stands up Zadorsky before finishing well past Harris from about 20 yards out. 43' GOAL! Kerr puts Chicago ahead! 42' YELLOW CARD: Camila picks up the first card of the game after fouling DiBernardo off the ball. 40' The corner comes to nothing as the referee blows for a foul on Naeher. 39' CHANCE! Orlando recycle the ball well after the corner and Pickett goes for goal from a long way out! Naeher gets her hands to the shot but it's another Orlando corner coming in. 38' A poor clearance by Short gives Orlando some respite and a corner kick. 36' Orlando are giving the Chicago midfield far too much space. Colaprico turns and runs with the ball before finding Kerr. The Australian ​international goes for goal with her right foot and can't get the angle she needs to beat Harris. 36' Orlando finally move with their own attack but Pickett's cross goes out for a goal kick. 34' CHANCE! This is become a theme now. Nagasato plays the ball into Kerr's path but her chip goes over the crossbar. The game has really opened up here and both teams are taking it to each other. Chicago have had the better chances but Harris has been unbeatable so far. 32' CHANCE! Kerr is through again but this time completely fluffs her lines! 31' CHANCE! Harris is keeping Orlando in this game! Kerr is free and and with only Harris to beat, the Pride goalkeeper sticks out a big arm to keep the score at 0-0! 30' CHANCE! Chicago almost take the lead again! Kerr gets the ball out wide and finds DiBernardo making a late run into the box. The midfielder goes for a diving header which ends up right in Harris' arms! 29' After consecutive corners, Orlando wins the free kick as Harris is fouled by an attacking Chicago player. 27' CHANCE! Chicago race up the other end and Mautz takes advantage of the space left by Pickett to go through on goal. She tries to chip Harris but the Orlando goalkeeper does well to tip it over for a corner! 27' CHANCE! After Kennedy does well to break pressure and find Carson Pickett, Morgan gets on the end of a cross and somehow can't convert! 24' A long ball founds Morgan battling with Katie Naughton but she can't angle her header away from Naeher. 22' Mautz puts in a tough tackle on Ubogagu as she tried to pick off a slack pass by Shelina Zadorsky. A foul is warded to Orlando and they move into Chicago's half. 21' Kerr is through on goal after being played in by Nagasato and she gets an effort on target, which Harris saves, but again the offside flag goes up. 20' Yuki Nagasato tip toes into space and is found by her midfield but she was well offside. 18' Chicago keep possession well but Colaprico gives the ball away as she was trying to pick out Short out wide. Orlando move forward but Gilliland holds up Ubogagu and wins a throw-in. 15' DiBernardo finds some space and drives forward before going for goal but her effort is blocked. 14' Alanna Kennedy almost finds Morgan at the back post but Short is alive to the danger and knocks the ball away from goal. 11' CHANCE! After Alyssa Mautz failed ot get her cross into the box, Arin Gilliland gets the ball in and Ali Krieger​ gets a touch. The ball comes to DiBernardo who heads it wide of goal. 10' It looks like Chicago are in a 4-4-2 instead of a 4-3-3 with DiBernardo playing out wide on the left. 8' Everyone is back on the pitch and Guido Gonzales has restarted the game. 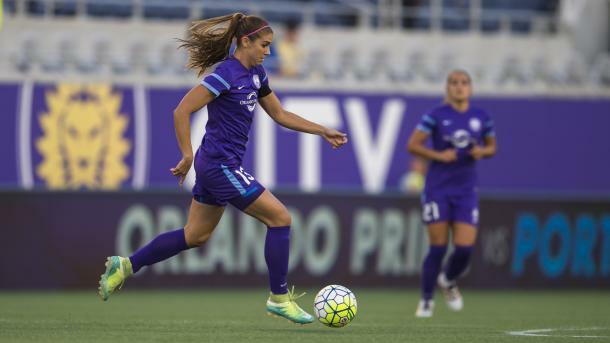 As per the Orlando Pride, the match will resume at 8:35PM ET. 8' The game has been stopped due to lightning in the area. 5' Alex Morgan ​gets a touch and swings it out wide for Ubogagu but Morgan is called offside and Chicago can move themselves up the field. 5' Camila almost breaks free on the counter but Danielle Colaprico commits a tactical foul and allows her backline to recover. Chicago clear the resulting free kick but Orlando keep possession. 3' Chioma Ubogagu sends in a cross that Alyssa Naeher chooses not to claim and Marta​ almost gets onto the end of it. Casey Short gets to the ball first and clears it away. Kerr's effort was form a tight angle but considering her form right now, you wouldn't have been surprised to see that nestle into the far corner of the goal. 1' CHANCE! What a start Chicago almost had there! Vanessa DiBernardo picked up Samantha Kerr with a long diagonal ball and with Ashlyn Harris to beat, Kerr sends her shot just wide! 1' We're officially off to the races in Orlando! We're not too far away from kick off now. Both teams have finished their warm ups and are now on the field ready to start. Nikki Stanton has dropped to the bench with Danielle Colaprico replacing her in Chicago's starting lineup. The Red Stars are otherwise unchanged from the team that played last weekend. Sydney Leroux has been ruled out tonight with a concussion and Carson Pickett comes in for Emily Van Egmond in what surely is a must-win game for Orlando. Chicago Red Stars Strating XI: Naeher; Gilliland, Naughton, Ertz, Short; DiBernardo, Brian, Colaprico; Mautz, Nagasato, Kerr. Orlando Pride Starting XI: Harris; Edmonds, Krieger, Zadorsky, Pickett; Kennedy, Weatherholt, Camila; Marta, Morgan, Ubogagu. The Chicago Red Stars, on the other hand, are safe in the knowledge that as long as they don't lose, they are in pole position to grab the final playoff spot. 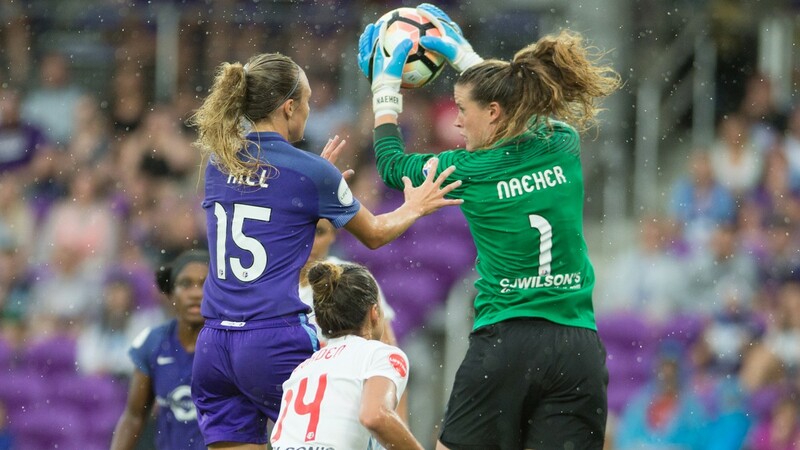 Tonight's match up in Orlando has huge playoff implications as anything less than a win for the Orlando Pride tonight could end their hopes of getting into the playoffs. Good evening everyone and welcome to another game in the National Women's Soccer League! Prediction: Neither team seem to be able to keep a clean sheet so I expect goals. I do however, think that Chicago are wily enough to come away from Orlando without losing and with the pressure on them to perform, Orlando's attack will find its form once again. The officiating crew for this match will be as follows; Guido Gonzales will be the center official, Gjovalin Bori and Jordan Davis will be the assistant referees, and Janessa Gunn will be the fourth official. Projected lineup for Chicago: Naeher; Gilliland, Naughton, Ertz, Short; DiBernardo, Brian, Stanton, Mautz; Nagasato, Kerr. Projected lineup for Orlando: Harris, Krieger, Kennedy, Zadorsky; Camila, Weatherholt, Van Egmond, Edmonds; Leroux, Morgan, Marta. The match will be played at Orlando City Stadium on August 25, 2018. The game will kick off at 7:30PM EST and will be broadcast on the NWSL App and NWSLSoccer.com. Chicago's key player is undoubtedly Samantha Kerr. The Australian has not slowed down form last season's exploits and is looking to win the Golden Boot this year. Kerr currently has 12 goals in 16 appearances and managed to score a brace in Chicago's last game against the Portland Thorns. Most of the defenses in the league have not managed to keep Kerr quiet, although she has been stopped eight times this season from scoring, and given how Orlando's backline has been performing recently, you can expect Kerr to be looking to exploit the space and lack of pace Orlando's three-back system has. The Chicago Red Stars have faired a little better than Orlando coming into this match up. They have won two of their last five games but have not lost any unlike Orlando who lost twice in their five game stretch. 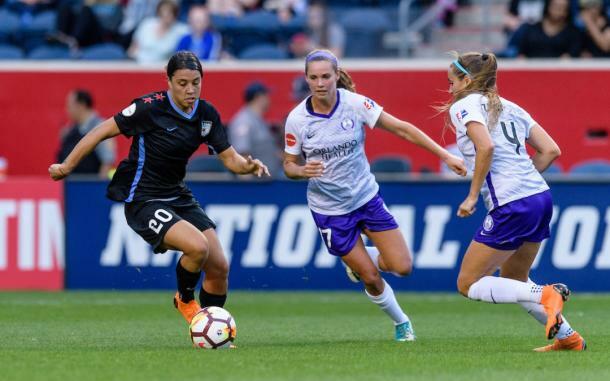 This puts Chicago in pole position to grab the final playoff spot after Portland Thorns FC and Seattle Reign FC booked their spots this week. They do not to make sure they do not lose against Orlando on Saturday to keep their destiny in their own hands and Rory Dames will be sure to produce a lineup that does that this weekend. The lack of goals is got to be concerning for head coach Tom Sermanni considering how leaky his backline has been in the last five games as well. With a lineup that consists of Alex Morgan, Marta and Sydney Leroux, finding the back of the net should not be this difficult for Orlando. They also have very capable midfielders behind that strike force so their failure to score is hard to fathom at the moment. Most would point at lineups and tactical changes being the source of not only the goal drought and the porous backline but one could argue that apart from Marta and Leroux, who only just returned from an illness, the Orlando midfield and attack has not lived up to their talent. Against Chicago, the Pride must find their form again or their playoff ambitions will end this weekend. The Orlando Pride are on a dangerous slide at the moment. After being in great spot to make the playoffs again this year, they have now fallen into sixth place due to only picking up one win in the last five games. They were soundly beaten by the North Carolina Courage last time out and have not managed to score a goal since their 2-2 draw with Sky Blue FC. The two teams have met each other twice before, both times in Chicago at Toyota Park Stadium. The last game, on May 26th, saw the Orlando Pride run out as 5-2 winners against the Chicago Red Stars that day. Since then, fortunes have changed for both sides. Hello everyone and welcome to another week in the National Women's Soccer League. This is Kudzi Musarurwa, your host for this match that could decide who between the Orlando Pride and the Chicago Red Stars, will take the final playoff spot this season. Stay tuned in to VAVEL USA as we count down to this big match up.